(Clockwise from bottom left) Equatorial, axial and tangential axial sections of Eolasiodiscus donbassicus, from Loeblich & Tappan (1964). The Lasiodiscidae are a group of fusulinids known from the Lower Carboniferous to the Upper Permian in which the test is primarily composed of a single tubular chamber (Loeblich & Tappan 1964). 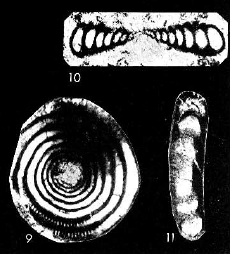 Characters (from Loeblich & Tappan 1964): Test planispiral to conical, proloculus followed by unsegmented tubular chamber; wall calcareous, with microgranular layer and radially built vitreous layer, latter concentrated as umbilical fillings perforated by canal-like fissures in advanced forms but consisting only of bridges across spiral suture in simple forms; aperture at open end of tubular chamber, with supplementary sutural openings.